Each fall, middle school students embark on various weeklong class trips, opening up a world of learning outside the classroom. The annual adventures are a highlight for middle schoolers. This year, grade 6 students visited the Santa Cruz Mountains; grade 7 toured national parks around the Southwest; and grade 8 sojourned to Washington, D.C. The Santa Cruz Mountains set the scene for grade 6 students to actively bond during their class trip to Mt. Cross. A camping and retreat site located in the redwood forest, Mt. Cross provided plenty of opportunities for kayaking, bird watching, completing a ropes course, swimming, and enjoying the area’s gorgeous weather and scenic beauty. A highlight of the trip was a visit to Elkhorn Slough National Estuarine Research Reserve, one of 28 such reserves established nationwide as field laboratories for scientific research and estuarine education. Following the reserve visit was an excursion to nearby Moss Landing, a quaint, historic fishing village known for its shopping, fresh seafood, fine art studios, and bird and whale watching. “The skies were blue, the temperatures warm … and the excitement palpable!” recalled Cindy Ellis, middle school division head, of the trip. 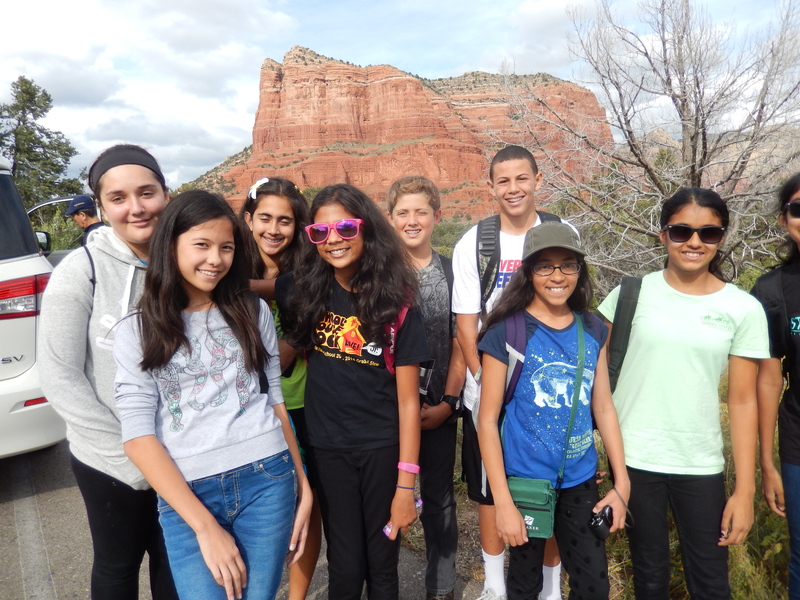 Grade 7 students were amazed by the Southwest’s scenic and historic national parks. In Arizona they enjoyed a jeep tour of Sedona, famous for its red rock formations and wildlife. In the Grand Canyon’s south rim, students participated in an organized trust walk (listening to directions while walking with eyes closed) as they headed toward the rim of the canyon. They also toured Monument Valley, known to many as “the eighth wonder of the world.” Monument Valley has been a significant place for centuries, and houses ruins that some believe belong to the mysterious Anasazi people who disappeared from the area hundreds of years ago. Another highlight was traveling to Zion National Park to hike the Emerald Pools, Whistling Rock and several other well-known trails. History came alive for grade 8 students visiting the nation’s capital in Washington, D.C. Accompanied by Jennifer Gargano, assistant head of school for academic affairs, the group’s tour began with a visit to the Jamestown Settlement, the first permanent English settlement in North America, and Colonial Williamsburg, an interpretation of a colonial American city. “Specialized guides showed us what it was like to live in Jamestown in the early 1600s. We were able to see how settlers prepared their food, how they made their clothes and the types of living quarters they had. The guides were impressed with our students’ knowledge of Jamestown,” reported Gargano. On a more somber note, the group visited the Martin Luther King Jr. Memorial, the Lincoln Memorial, the Korean War Veterans Memorial, the Vietnam Veterans Memorial Wall, the Iwo Jima U.S. Marine Corps Memorial and Arlington Cemetery. During a visit to Ford’s Theatre, students learned about what occurred on the day of Abraham Lincoln’s assassination and were able to view the balcony where he was shot. The trip concluded with visits to the Capitol building, and tours of the House of Representatives, the Library of Congress and the Supreme Court.